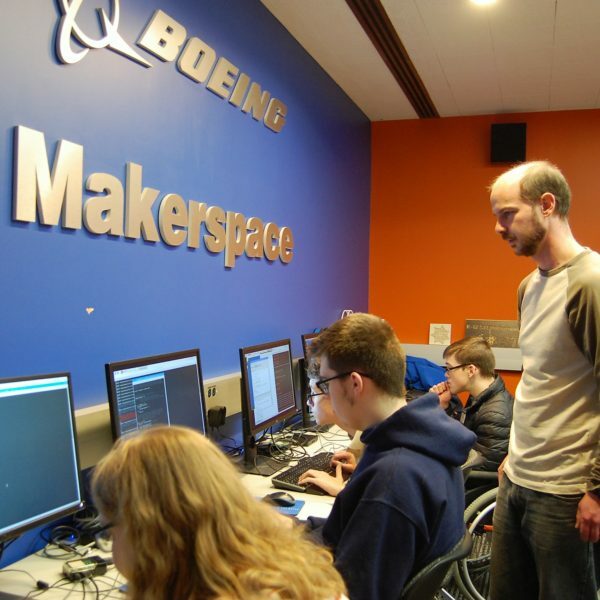 This year, 11 high school students decided to do more with their annual day off on January 21 — they chose to spend the day building valuable career skills during the DREAM BIG Learn to Code event at our partner company Boeing. Students came from all different high schools around the region, like Affton and Parkway, and as far away as Mascoutah and Carrollton. Students also had a variety of disabilities including Autism, learning disabilities, cerebral palsy, and muscular dystrophy. “This is an exclusive opportunity for our students to gain hands-on experience in an in-demand career field,” says Sarah Schwegel, Youth Transition Coordinator at SDI. “Kids with disabilities just don’t get exposure like this otherwise.” They started the day with icebreakers led by SDI staff and a tour of the James McDonnell Prolog Room—a mini museum with models of McDonnell Douglas and Boeing aircraft from the past and present. After the tour, the students participated in an introduction to computer science workshop. The workshop taught them about the different aspects of coding, culminating in writing a program that would launch a virtual rocket. Many students loved this activity, but a few said they were glad they had the opportunity to participate because they thought they wanted to go into computers, and now they aren’t sure. Boeing employees joined the group for a casual networking lunch around a delicious burger bar. More Boeing employees joined in for a formal speed-networking exercise in which students each got 5 minutes to talk to 11 different employees. Afterward, SDI staff led wrap up. Many students reported that they were surprised Boeing had so many jobs, that they thought Boeing just made aircraft. All of them said they were glad they attended and were looking forward to attending more events in the future. Thank you to our wonderful partners at Boeing for organizing this special day for our Dream Big students!